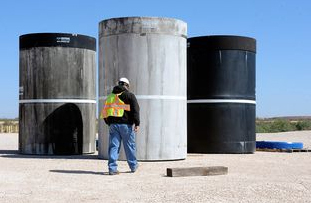 John Ward, operations project task manager at Waste Control Specialists’ facility near Andrews, Texas, walks over to inspect concrete canisters that will house drums of nuclear waste. Earlier this month, Texas’ 3rd Court of Appeals upheld a lower court’s ruling that the Texas Commission on Environmental Quality properly denied the group a hearing because none of its members met the threshold of being a "person affected." At issue in that Sierra Club case was one of several permits the TCEQ has granted Waste Control Specialists. The permit enabled the company to dispose of high-purity uranium metal that originated at a long-closed U.S. Department of Energy Facility that is now a "Superfund" site. But the three-judge panel said the TCEQ — whose analysis showed that the disposal site would have minimal impacts — had the authority to rule that those members were not "affected." "Our concern is that this ruling could be applied broadly and that it would make it very difficult for folks to be granted the right to a contested-case hearing," he said. "It could also eliminate the right of all Texans to present evidence and challenge the decisions of a state agency." In an emailed statement, the TCEQ said it was "very pleased" with the court’s decision, and that the agency takes seriously "its obligations to uphold the law — as was done in this case." "It’s a bit of a mess," he said. "This process is used by all sides to game the system."